Forsythia is primarily an Asian genus, and has been cultivated in Chinese landscapes since at least the Tang dynasty (618-907 AD). Of the eleven generally accepted species, ten are native to eastern Asia, and just one is native to the mountains of the Balkan Peninsula, in southeastern Europe (not “discovered” until 1897). Although seemingly ubiquitous during most springs, there are no species native to North America. 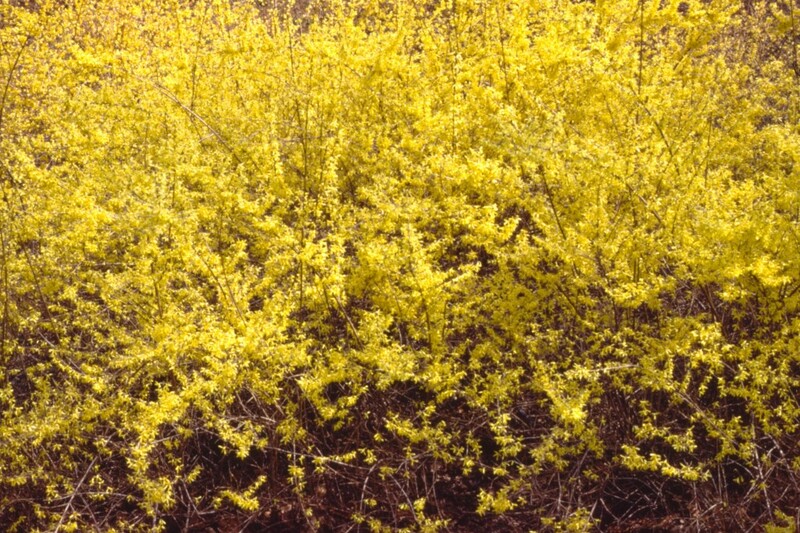 First introduced to European horticulture in the 1830’s, Forsythia has unquestionably become one of the popular, dependable, definitions of spring. Forsythia is named to honor William Forsyth (1737-1804), Scottish plantsman, and King George’s (1738-1820) Superintendent at the Chelsea Physic Garden. Forsyth was one of the founders of the Royal Horticultural Society in 1804. 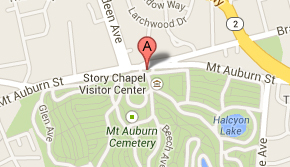 Unfortunately, Forsyth’s legacy also includes Forsyth’s Plaister, a purported heal-all for wounds of injured trees. Analogous perhaps to some modern products, pitched on late-night television, this concoction of cow-dung, wood-ash, lime-rubble, sand, urine and soap, actually received a substantial British Government grant in hopes it would help produce more perfect oak trees, then urgently needed for the Navy. Nonetheless, it proved to be a worthless compound. These deciduous shrubs are in the OLEACEAE, the olive family, have characteristic opposite branching, often with arching stems, growing six to ten feet high. The much loved, bell-like flowers have four petals. 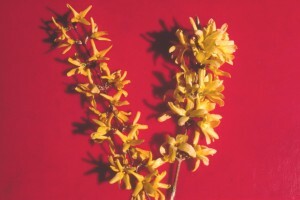 Forsythia flowers occur from buds on branches that were produced the previous summer. 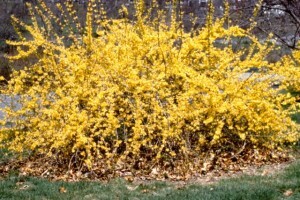 Undoubtedly the most frequently planted Forsythia, is Forsythia x intermedia, a hybrid. A plant hybrid is the offspring, resulting from two different species that cross pollinate. Hybrids often happen naturally, but they are also frequently the result of human intervention. Of added interest, cutting branches in February or/and March, and putting them in water, in warm indoor rooms, allows reliable “forcing” of the flowers. 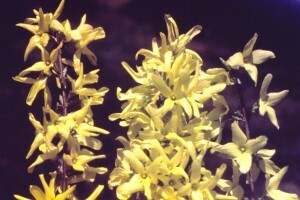 Hence, Forsythia is popular for floral arrangements, or just to speed along the end of long winters. After the horticultural barrenness of this past winter, on your spring visit to Mount Auburn, look for our myriad golden yellow flowers of Forsythia, on Garden Avenue, Elm Avenue, Birch Avenue, Story Road, Field Road, and Hazel Path, among other locations. wait for the touch of Easter. answer in myself except silence. “That’s silly. How can there be a wrong direction? 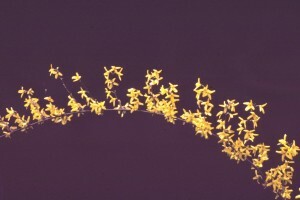 Planted on the lawn of my childhood home were three forsythias–one planted when my parents moved in, the next when I was born, the third when my sister was born. 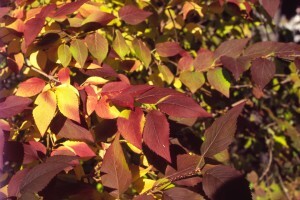 I can see them now, a beautiful bright yellow mass, followed by attractive green leaves. 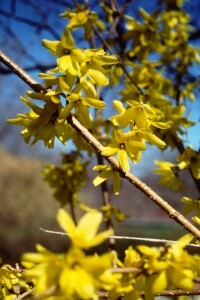 Thank you for such an informative article–I had no idea the forsythia was related to olive! PS The poems were wonderful too! Thank you, Jim. Nice culture. I went out and clipped a couple of forsythia branches, just a little late.